All on 6 was developed as a way to best restore the full arches of the upper and lower jaws using biomechanics, computer simulation, and clinical research. 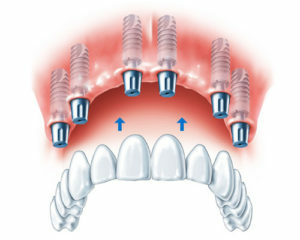 This technique provides our patients with a non-removable dental arch that is secured by as little as six dental implants. All on 6 is the perfect option for patients who have or need dentures or need complete restorations on the upper or lower teeth. In order for us to properly evaluate your case, you will initially require a consultation and diagnostic appointment in order to best determine the treatment path necessary for your case. This includes determining whether or not your case will require extractions, gathering the appropriate information via X-rays, Panoramic scans and impressions and any other photos required. Directly after this consultation, you will be scheduled for implant surgery in which the new replacement teeth are fitted and adjusted all in one appointment, including any necessary extractions. 6 titanium implants are placed in the jaw in such a way that the bone will envelop and secure them into place. Once the four implants are secure, the abutments will be attached so that the replacement teeth can be fastened and adjusted for maximum comfort and function giving you a brand new radiant smile. Because only 6 implants are used in the procedure, the entire process is much less invasive and involves less surgical time than previous treatments. The beauty of this new procedure is the sheer convenience. Special implants were developed for this treatment allowing for the immediate fitting of replacement teeth to the abutments. This means that with only 6 implants, patients can leave our dental office with a full set of new replacement teeth! No bone grafts necessary! The teeth are permanent and fixed so there is no need for patients to be without teeth or to endure temporary dentures for an extended time period. The patient is enabled to come for a morning appointment and leave that same afternoon with a brand new radiant smile!